As the longest serving Los Angeles Business Journal judge, it is amazing to see all of the accomplishments and great talent Los Angeles has to offer. It has been an honor to participate in the LABJ CFO of the Year Awards for the last three years. Over time, I’ve come to recognize some common themes from the most successful CFOs and businesses. 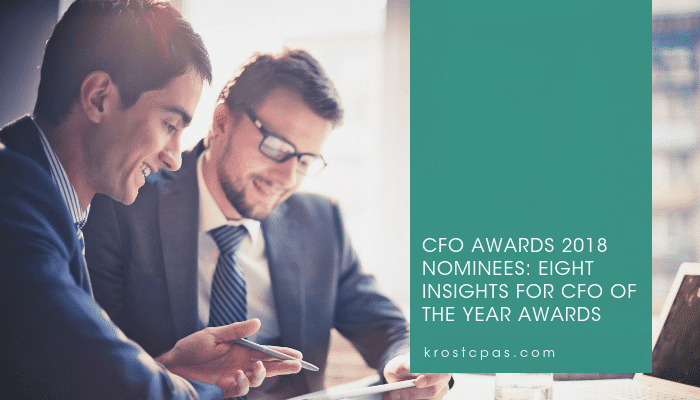 Every previous winner shares these characteristics and here are eight insights to help guide your path to become the next CFO of the Year. 1. Financial success is built on the foundation of strong qualitative factors. While quantitative factors are important because they are measurable, the numbers do not tell the entire story. The years or months of struggle and uncertainty were built on the foundation of strong qualitative factors including leadership, inspiration, and an inquisitive mind. Success doesn’t happen overnight, and instead built step-by-step. 2. To build success, each of these CFOs has to understand and document benchmarks. Quantitative measurable growth can only be done if it can be measured against certain benchmarks, including the business’ current progress. Gathering information and understanding each of the processes helps the CFO see the bigger picture and communicate their observations and key metrics to the executive management. At times, this requires assistance from outside providers. 3. CFOs have strong teams. The most successful CFOs find and retain the best talent, foster growth and develop them to leaders. 4. CFOs also have strong support structures. The support structure may include trusted advisors, the community, circles of influence, mentors, mentees, or family. Each personality brings a different perspective that the CFO is willing to learn from and uses their judgment to implement the strategies that match the Company’s mission and goals. 5. Success is defined by the company’s mission and goals. No judge can measure a company’s success because each company is different. Some companies judge success by reaching a certain revenue metric, an amount that reaches the bottom line, or the number of additional headcount that the business supports. The CFO embodies their company’s goals and guides their company towards that vision. The CFOs who contribute their time and energy to causes that are more than the business show their depth. The CFO sees the company and their community as something more meaningful than just numbers. We are left in awe to how each of these CFOs are able to balance work and life. 7. There is a strong synergy between the CFO and executive management. They understand the strategic vision and find opportunities to achieve the company’s goals. At times, this is the biggest battle. Aligning all the different views within executive management and gear them towards a common goal. This will take consistent communication and patience. The CFO navigates through these challenges to implement a strategy that they believe is the right direction for the company. 8. The CFO identifies and implements innovative or disruptive industry changing processes to their business. I consistently see the words innovation and disruption, but what does it mean? To me, innovation and disruption is the consideration and implementation of strategies outside of their current business model. My consideration of innovation gravitates to processes that are new to the business and align with the Company’s mission and goals. A strong sense of the strategic view allows these CFOs to identify the pain points and implement processes that are unique to the business to improve or maintain its successful performance. Each CFO nominated to the Los Angeles Business Journal CFO of the Year Awards should be extremely proud of this feat. The variety of backgrounds including CPAs, MBAs, JDs, or others has led these CFOs to a successful path. At this annual event, we honor the CFOs of Los Angeles, whether successful now or at the beginning stages of their career. Their efforts to both the business and community lay the foundation of success for their companies, employees, and Los Angeles. As a Board Officer of CalCPA – Los Angeles Chapter and a team member of KROST CPAs & Consultants, I wish to personally congratulate them on their accomplishments.